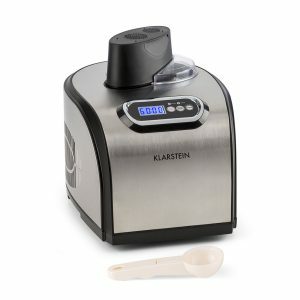 Silver Klarstein Sweet Dreams is a hot recent release stainless steel ice cream machine with a decent compressor and a contemporary design. Because of the integrated compressor, you don’t need to cool the unit container or the ingredients in the freezer like you have to with some other models. It is a family size turbo ice cream machine that makes as much as 50 fl.oz of fresh and tasty ice cream or frozen yogurt within only half to an hour. 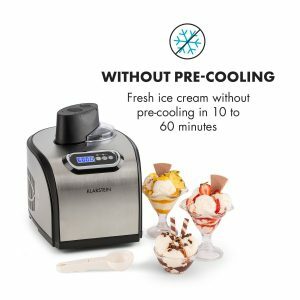 Ice cream is solidified and ready within less than an hour and you can set the timer for between ten and sixty minutes. Karlstein is easy to operate with just the Power, Start/Stop and Timer buttons. And you have the blue LCD display that shows the time remaining as well as the red Cooling and green Mixing indicators. With a power consumption of 150 watts, it is cheap to run and will not be much of a burden on your energy bills at all. It is designed as a kid-friendly product with an easy operation thanks to the simple button control as well as the lack of pre-freezing of the ingredients or the container. You just start it if it is already powered on and set the timer after putting the ingredients into the container. And the remaining time will be shown on the blue-backlit display. It is very easy to clean once you’re done with ice cream making. Klarstein is by the international Berlin Brands Group Inc. that is located in San Francisco, California. The company offers good quality and original products including kitchen appliances with an innovative and unique design, inspired by the creativity of Berlin that is combined with the best German engineering. They have both the great modern looks and technical functionality. Silver Klarstein Sweet Dreams weighs just over 22 pounds (shipping weight of 25.6 pounds) and measures 14.6 x 11.5 x 12.6 inches, so it is a bit large and heavy and you need a bit of space for it on your bench or for storage. Anything that comes in touch with food is BPA-free and the aluminum canister is food safe. It will let you make fresh, smooth, creamy, tasty and healthy ice cream that is free of any additives, artificial substances or extra calories from the store bought ice cream. The compressor runs efficiently at very low temperatures and fairly quietly without disturbing you and thanks to the lack of pre-freezing you can make batches without breaks. A couple of customers commented that the taste of the ice cream is much better than what you can buy at the shops and the consistency very smooth and creamy. Please note that you will get a flat, two-pronged plug that you can use in the US and the power supply is 110-120 Volts, which is good for North America.